My suitcase is brimming with a preponderance of Lilly items (thanks, Hopsy!). Tucked in amongst the spring clothes is a stack of carefully chosen books. My iPod is loaded with favorite songs. I've printed off some NY Times crosswords that I missed last month. I'm also taking my laptop, so look for some pictures and updates posted from my beach chair. Have a great trip! You are in for a nice, relaxing vacation! Enjoy! Oh, enjoy every moment. Can't wait to hear all about it when you get home!! Have a wonderful time...sure to be an amazing trip! You deserve a great time with your family! And what better place? None, Hawaii is perfect for relaxation. Enjoy each other, the sun, the food and the fruit, and smells and the ocean. Have a mai tai for me please, while you're looking at the sunset and smelling your plumeria lei. I wish I was in your suitcase too! Have a wonderful holiday. I hope it's everything you are looking forward to. Have a wonderful, relaxing trip!!! So happy to hear you'll finally be relaxing. Enjoy every minute and make sure you post what books you brought with you. Wish I could get in your suitcase! Oh and another thing we have in common? I grew up with my beloved cat Percy. His full name was Perciville DeClaude Kat. hehee! 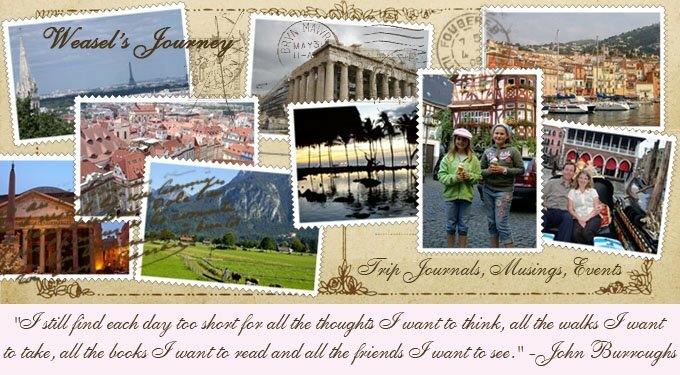 Just read about your trip - it sounds and looks so wonderful. I have YET to go to Hawaii!!!!! Now I almost feel like I've been there !!! haha - glad you had a safe and happy trip!! !